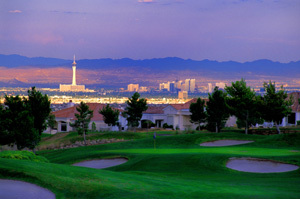 Eagle Crest is a 4, 067-yard, par-60 executive course built along some of the highest points in Summerlin. 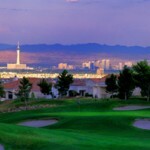 Besides featuring panoramic views of the city, the course offers plenty of challenge for players who appreciate a timely-usually about 3 ½ hours-18-hole round. Designer Casper says, “You can take any hole from this course, put it in the middle of a championship course, and it would fit right in.” Built into the side of a mountain, the layout is undulant throughout, very picturesque and cozy in its surroundings of Summerlin homes. 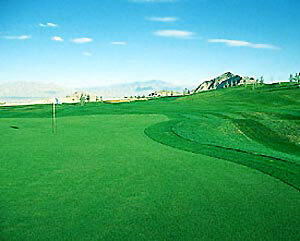 The 14 par-3 holes offer a broad length variety, from a short 112 yards to a demanding 224 yards. Three of the six par 4s play less than 350 yards, while two, the 9th and 13th, measure just over 400 yards. The dogleg-right, 347-yard 5th hole is cleverly designed to give players risk-reward choices. Water runs from tee to green along the right side, and fairway bunkers left further pinch the landing area for a long-iron or fairway-metal tee shot. Players who instinctively reach for the driver take note: The fairway narrows beyond the bunkers, and an additional fairway bunker left waits to punish drivers that shy too far away from the water. Greenside bunkers left and back guard the putting surface. The 18th hole is a straightaway par 4 playing 370 yards. About 250 yards out, the fairway drops 40 feet towards a large green. Two large fairway bunkers left await pulled tee shots and greenside bunkers back left and right guard the front-to-back putting surface. 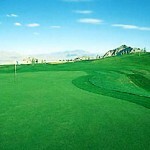 Book Eagle Crest Golf Club Now!